We are seeking sponsors and partnerships for this impactful education program. This is your opportunity to provide the deaf children of Haiti with school needs such as school supplies, books, and uniforms, which will better prepare them to enter the Haitian Government Educational System. Here in Haiti school starts on Monday September 4th 2017. This should be a joyous day for the children, but unfortunately most parents could not afford to buy school supplies, shoes, or clothing for their children. With your help we can make this possible.We know the value of Education. We know the struggles of wanting to go to school but not being able to. This is the reason we commit to stand beside these voiceless deaf children. 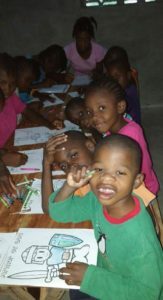 Pignon Christian Center for the Deaf, PCCD, was established in January 2013. Since opening our students have not had a decent classroom, but that has not stopped them from learning. We are focused on teaching them the basics of sign language. They will learn to understand, receive, and give signs. They will learn to communicate with each other and others who use sign language. We would have not gotten this far without prayers and the support of churches and individuals like you. Thank you for understanding our inspiration to move forward and help these neglected children. Since the opening of PCCD our students have not warned uniforms. Now that we are more evolved we must follow the Haitian Government Educational System guidelines. Under these guidelines every student must wear uniform and have the necessary school supplies and books to aid them to receive the best education possible. PCCD is once again responsible for student enrollment and providing school supplies, books, uniforms and funding for the staff. Most important school supplies books and uniforms. We are so grateful for your time and support may God bless you.